SharePoint provides a lot of different out-of-the-box Web Parts. But sometimes we wish a particular web part behaved in a little different way, or have some small extra functionality. Or we may want to implement a heavily modified Web Part, based on already existing one. 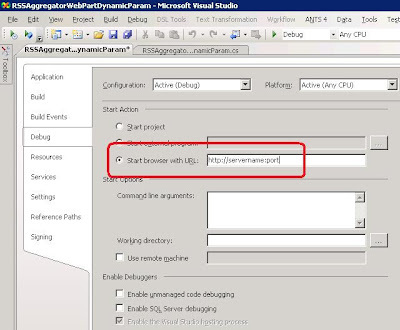 Today, I will show you how to extend the functionality of an already existing web part. Those placeholders in my example are fictional, but you should get the idea of a dynamic value passed as a parameter to the service. Our goal is to override the default behavior of the Feed URL field. We want to get to a point where we actually control how the Feed URL is being interpreted. We may want to replace placeholders with actual values, or do any other kind of adjustment of the URL, based on current and dynamic conditions. So here is the plan: we create a new web part, inherit the RSS Viewer web part and extend the Feed URL property. See the RSS Feed URL field? That's what we are interested in. 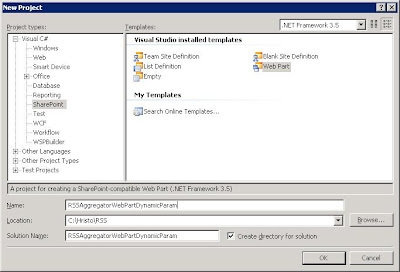 Ok, start Visual Studio 2008 with the VSeWSS plugin installed. 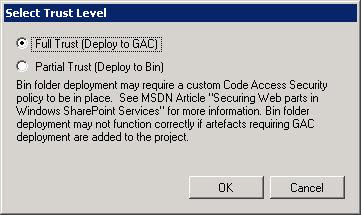 From the menu, start a new SharePoint -> Web Part project. Right click on your project, click on Properties, go to the Debug tab and set the SharePoint site URL you will be deploying to. 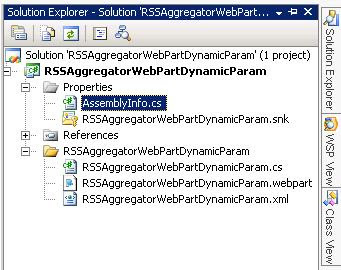 Open the RSSAggregatorWebPartDynamicParam.webpart file and set Title and Description to whatever you like. Add this file as a reference - C:\Program Files\Common Files\Microsoft Shared\Web Server Extensions\12\ISAPI\microsoft.sharepoint.portal.dll. This is where the RSS View class is defined. Basically, we no longer inherit the basic WebPart class. 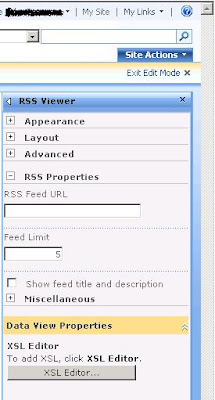 Instead, we now inherit the whole functionality of the RSS Viewer web part and all of its user interface! You can also delete this function, as we are not going to do any changes there. 1. The FeedUrl property is the one which handles the URL which points to the RSS feed. 3. Note the 'new' keyword. This way we hide the underlying base FeedUrl property. So, in OverrideURL we can change any way we like the URL that is set in the User Interface and then return it modified. At this point, it is up to you how to utilize this capability. For the purpose of the example, let's just look for the string #current_date# in the URL and replace it with the current date. I will be checking this later. As usual, you can get the full source code here. But basically that's it. With minimum amount of code and effort, we have extended the functionality of an already existing web part, to something that serves our concrete needs. iTechnology is an expert company that provides custom development and consulting using SharePoint and Silverlight solutions. We also specialize in delivering quality solutions driven by K2 and Nintex and provide professional care and support to our customers. Our ambitious product, iTFA, is a free electronic Forms Designer that promises great functionality. It is intuitive, easy to use tool that allows all users to customize and manage wide variety of forms. To learn more about iTFA visit our Live Demo page or go to our company website to learn more about iTechnology services.